The civil parish of Sutton is situated in northeast Norfolk, to the south of Stalham. Its name comes from the Old English for ‘southern enclosure’. 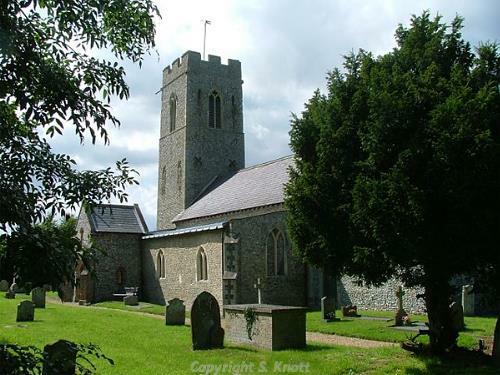 The parish has a long history, and was certainly well established by the time of the Norman Conquest, its population, land ownership and productive resources being detailed in the Domesday Book of 1086. Setting aside prehistoric but otherwise undateable objects, the earliest evidence of human activity comes in the form of Neolithic flint tools, including a chipped axehead (NHER 8314), polished axeheads (NHER 8315 and 8322), arrowheads (NHER 8318) and a scraper (NHER 33986). The cropmarks of a possible ring ditch (NHER 49328), probably the remains of a Bronze Age round barrow, are visible to the east of Landseer Poultry Farm on aerial photographs. Bronze Age finds to date are a pottery vessel (NHER 8237), a copper alloy axehead (NHER 8316) and palstave (NHER 28439), shields and dishes (NHER 8317) and a decorated shield (NHER 8318). There are no Iron Age finds so far, though analysis of aerial photographs has identified the cropmarks of old enclosures (NHER 49323) that may be Iron Age or Roman in date. The cropmarks of other enclosures (NHER 49327, 49329 and 49330) and field boundaries (NHER 49310 and 49315) are thought to Roman. Roman finds are pottery fragments (NHER 12704, 33428, 33986 and 35020), a coin (NHER 33145) and a fragment of a cauldron (NHER 33989). There is currently no evidence of Saxon activity, but this may well change with future investigation. The medieval period has left the parish with its earliest surviving building, St Michael’s Church (NHER 8335). This is a well-maintained church, dating mainly to the early 14th century, with alterations and additions (including the originally two storey south porch) in the late 15th century. Restorations took place in 1848, and the building was re-roofed in 1891, when the windows were restored. Inside is a good late 14th century font and a 17th century pulpit and reading desk. Barton and Sutton Broads (NHER 13510) are the remains of medieval peat cuttings, which flooded after they became disused. The Broad was used as a decoy pond in the 16th century. An island, known as Pleasure Island, once contained a bandstand and pleasure ground. Medieval finds include pottery fragments (NHER 8319, 25020, 33428 and 33986), tiles (NHER 33986, 33990 and 33993), coins (NHER 33144, 33145 and 40022) and a ewer spout (NHER 25020). A silver seal matrix (NHER 33145) may be medieval or post medieval. Of the post medieval buildings to survive, probably the earliest is Durrant’s Farmhouse (NHER 47372) on Church Road, two 17th century brick and flint houses, now one property, with a thatched roof and later alterations and additions. High Cottage (NHER 30684) on Rectory Road is a late 17th century two storey thatched brick house with a date of 1697 on the south gable and later alterations. Stone Cottage (NHER 47650) on Old Yarmouth Road is two late 18th century two storey flint and brick cottages, now one house, with a pantiled roof. Ingham Mill (NHER 8247) on Mill Farm is the brick tower of a 19th century windmill, last used in 1933. It was converted in 1934 for use as a Royal Observer Corps (ROC) post and continued in this this role until 1959, when the ROC moved to an underground monitoring bunker. Sutton Mill (NHER 8334) on New Road is the most prominent landmark in the parish, a tall nine floor tower corn windmill of 1859, replacing one of 1789 which burnt down. The mill ceased working after being struck by lightning in 1940, but retains much of its original machinery. It was restored by the owners from 1976 onwards and is open to the public. Attached to the mill is a big three storey granary, also of 1859. To the east is a row of possible former brickworkers' houses, although there is no trace of the old brickworks. The former miller's house, which dates to 1789 and served the earlier mill, is now a residential home. A post medieval duck decoy (NHER 49340) can be seen from the air, located within Middle Marsh to the east of Barton Broad. South of Sutton village, near Allotment Gardens, is reported to be where the Sutton Trot horse market (NHER 25021) took place. P. Aldridge (NLA), 30 July 2007.
http://www.norfolkchurches.co.uk/sutton/sutton.htm, Accessed 18 July 2007.